Every parent’s experience with Autism is different. This webcast will focus on how one parent learned to tap into social capital by developing support systems to help her family and her son understand Autism. Nicci is transparent and shares that although she is not an “Autism expert”, she recognizes that the tips shared could benefit any parent who is beginning their journey with Autism. Nicci Dowd received her Master’s degree from Marymount University and is currently a doctoral candidate at Regent University. She has served on school and county committees related to advancing educational experiences for students with diverse learning needs. She initiated and currently serves as the chair of her school’s I’M Determined Committee. With this committee, she works alongside its members by connecting with key stakeholders while providing self-determination opportunities for students with disabilities. She has also served as a presenter for the Autism Society of Northern Virginia. A few years ago, she actively participated in the Virginia Department of Education Applied Studies Diploma pilot project. She has served as an Advisory Board Member for the State of the Art Conference for Individuals with Intellectual Disabilities. 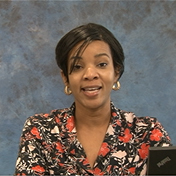 Most recently, Nicci serves as a Parent Leader for the VDOE I’m Determined project.